Today, two days after Takahito Aiki, took over the reins as CEO of Kobo, he has announced the effective consolidation of the Sony ebook business under Kobo in North America. It is almost certain that this is the final and long overdue retreat of Sony from a market that they expected to win and sadly lost from beginning. It also sends a strong signal to the market that the dominance of Amazon in this sector is real and is giving even those with potential credentials and market presence a hard time. 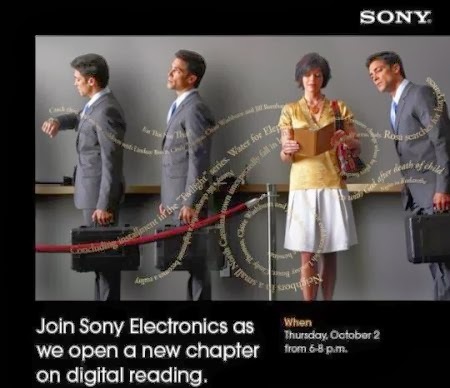 Sony entered the market some 8 years ago with huge fanfare, fancy ebook readers based on eink and were the early adopter and major driver and influencer on Adobe’s ACS4 DRM service. I remember meeting their senior players once in San Deigo and listening to how they were going to dominate the academic and educational markets. But their offer and market understanding was always someway behind their words. It’s also somewhat ironic that this death knell has occurred at the same time that Adobe has also gone through the PR mangle and has had to retract so publicly on their ACS5 statements. So we have Sony ready to preinstall Kobo on its smartphones , laptops and other devices and to hand over their customers and business to Rakuten and its Canadian ebook subsidiary Kobo. It’s also interesting as it comes at a time when devices matter little and the platform is what counts. How smooth the takeover will be for those who backed Sony and bought their devices and ebooks remains to be seen, but transferring encrypted DRM licences is not always as easy as you would expect. All this is without considering how they are going to deal with those Sony BBeb licences. Some accept that Sony has been facing many challenges across its business and they may still come back, but with many bases to cover this seems highly unlikely. So we read the usual hype and words on what this means, and how it is going to make the difference, but the reality is that another door is shutting and real consolidation is happening. The obvious next candidate is Nook, which on the face of it would be destined for Microsoft, the discussion on this are already in play as Barnes and Noble grapple with the same issues and facts of life. Now if we just look at the North American market at a potential combination of Nook, Kobo and Sony that would certainly give Apple a challenge and wake them up from their apparent complacency. This sort of consolidation works best in the established and dominant North American market where it can be honed before it goes global. So what’s the betting on Nook going somewhere soon?